You already have access to an extensive network of tunnels, which is guaranteed to be connected and free of cyclic paths. In other words, the existing tunnels form a tree structure. This system can be represented by N junctions, labelled 1 through N, connected by N - 1 tunnels, each of which connects two junctions. Tunnels can be traversed in either direction (i.e., if there is a junction from a to b, that junction also goes from b to a). 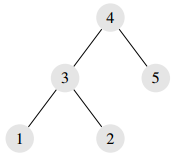 The first line of each test case will contain N (3 ≤ N ≤ 400 000), the number of junctions. The next N - 1 lines will each contain two space-separated integers i and j, indicating that there is a tunnel between junctions i and j. For test cases worth 40% of the points, you may assume N ≤ 5000.